Rodney M. Baine *↤ Rodney M. Baine, Professor of English at the University of Georgia, is the author of several books and articles on eighteenth-century English and American literature, including Daniel Defoe and the Supernatural. ↤ 1 The Novels and Miscellaneous Works of Daniel De Foe (Oxford: Tegg, 1840-41), X, 60. How cams’t thou there, thou fault sublime? And into spirit thyself insinuate? From what dark state? from what deep place? From what strange uncreated race? Before void chaos heard the forming sound? And how at first didst thou come there? But even if “The Tyger” reflects no early memories of The History of the Devil, Blake, we now know, read and illustrated Robinson Crusoe. The evidence has been singularly disordered: one piece has dropped out of sight; another has been confused with the first; the third has never before been correctly identified. The first was listed in 1863 by William Michael Rossetti among Blake’s colored works in his “Descriptive Catalogue.” Rossetti identified it as “Robinson Crusoe. A visionary effect of colour, like a transparency. [e] Fine.”2↤ 2 Alexander Gilchrist, Life of William Blake, 2nd ed. rev. (London: Macmillan, 1880), II, 249, No. 236. In both the 1863 edition (II, 235) and the W. Graham Robertson edition of 1907 (p. 458) it is No. 209. The 1863 edition tentatively located this portrait in the collection of “[Admiral Popham (? )],” but the 1880 edition excised this conjecture. Nothing more seems to be known about this portrait of Crusoe, which eludes my identification. 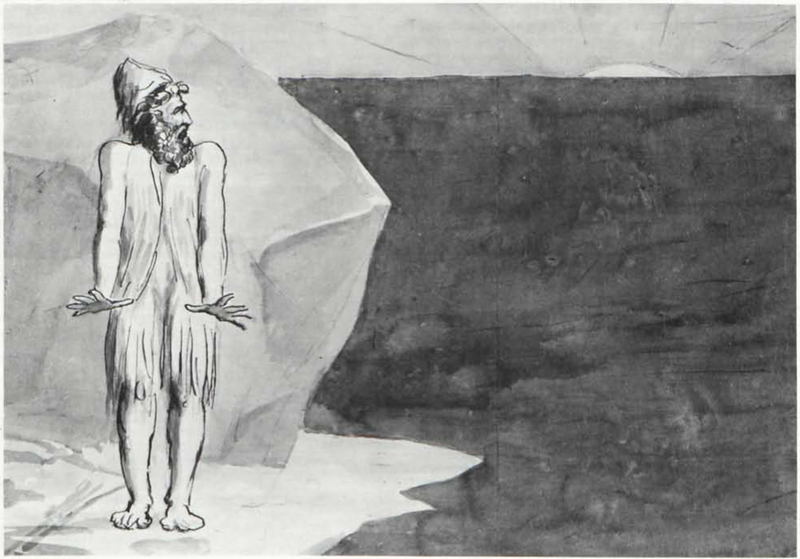 1 An illustration by Blake to Robinson Crusoe. Pen and India-ink wash over pencil, about 31 × 43 cm. Reproduction by permission of the City Museum and Art Gallery, Birmingham, England. 2 An illustration by Blake to Robinson Crusoe. Unfinished; India-ink wash with pen outlines, 17 × 22 cm. Reproduction by permission of the Trustees of the British Museum. I had a great high shapeless cap, made of a goat’s skin, with a flap hanging down behind. . . .
By this time Crusoe has cut his beard “pretty short, except what grew,” he adds, “on my upper lip, which I had trimm’d into a large pair of Mahometan whiskers” (p. 122). These can easily be seen in the sketch. Blake clothed his Crusoe far more accurately than did his contemporary illustrators, for the garb which many of them gave Crusoe would have kept him warm in an Antarctic climate. But Crusoe specifically states that he made his clothes “loose, for they were [he explains] rather wanting to keep me cool than to keep me warm” (p. 110). Blake altered only one, significant detail. Defoe laid the scene at noon (p. 125). To heighten Crusoe’s isolation and terror Blake chose a setting sun. For that night the fearful Crusoe slept not at all, imagining that the single footprint must have been the work of the Devil. Yet he is eventually persuaded that it is a sign and promise of Providence. The third piece of evidence is a design, now in the British Museum, in India-ink wash with pen outlines [illus. 2].6↤ 6 This design, which measures approximately 17 × 22 cm., is among the Blake drawings presented to the British Museum by J. Deffett Francis in 1873 and 1874. By the kind permission of the Trustees of the British Museum it is here reproduced for the first time. It has never been correctly identified. According to Laurence Binyon’s misleading description, it represents “A SORT OF GARDEN, over the vast wall of which great cedars thrust their branches: in the center, a walled well, surrounded by young trees, and with a ladder leaning on it; and r[ight], the figure of a man.”7↤ 7 Laurence Binyon, ed., A Catalogue of Drawings by British Artists . . . in the British Museum (London: British Museum, 1898), I. 130. Knowing that Blake hardly ever drew a landscape, Binyon even questioned the attribution to Blake. Had he recognized the design as a begin page 53 | ↑ back to top sketch[e] from Robinson Crusoe and remembered that Blake had certainly made at least two other sketches for the novel, he probably would have accepted it without question as Blake’s. The drawing actually shows no sign of a well, but pictures unmistakably Robinson Crusoe’s fortification, with Crusoe sketched lightly at the right. This palisade, as Crusoe describes it, was backed against a “rising hill, whose front towards this little plain was steep as a house-side.” As Crusoe relates, he constructed it “ten yards in its semidiameter from the rock, and twenty yards in its diameter from its beginning and ending” (p. 50). In this half circle I pitch’d two rows of strong stakes, driving them into the ground till they stood very firm like piles, the biggest end being out of the ground about five foot and a half, and sharpen’d on the top; the two rows did not stand above six inches from one another. The trees in the semicircle are actually thus the sprouted stakes, as Crusoe later explains: “Those piles grew all like trees, and were by this time grown so big, and spread so very much, that there was not the least appearance to any one’s view of any habitation behind them” (p. 123). “The entrance into this place I made to be not by a door,” Crusoe adds, “but by a short ladder to go over the top . . . ” (p. 50). 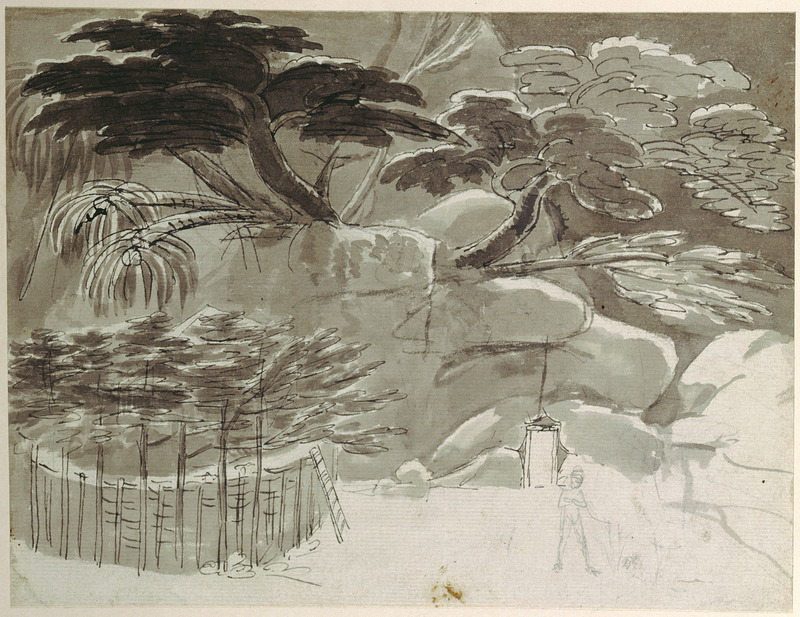 In Blake’s drawing the main entrance to Crusoe’s cave is largely concealed. The door at the viewer’s right, Crusoe constructs later: “I work’d side-ways to the right hand into the rock, and then turning to the right again, work’d quite out and made me a door to come out, on the outside of my pale or fortification” (p. 57). In Blake’s unfinished drawing it is difficult to make out what Crusoe is doing, for his figure and immediate surroundings are quite indistinct. A glance at the novel, however, shows that he is discovering, or cultivating, the barley and rice which have miraculously appeared on one side of the fortification. Needing a bag which had once contained grain but now seemed to be reduced by rodents to “husks and dust,” Crusoe “shook the husks of corn out of it on one side of my fortification under the rock” (p. 65). Some time later, he continues, “I saw some few stalks of something green shooting out of the ground.” Not long there-after, “I saw about ten or twelve ears come out, which were perfect green barley. . . . ” “I saw near it still,” Crusoe adds, “all along by the side of the rock, some other straggling stalks, which prov’d to be stalks of ryce . . . ” (pp. 65-66). Blake’s drawings show that he followed the novel accurately and pictured it correctly. His selection of this last incident, moreover, one neglected by other illustrators of Robinson Crusoe, shows that he understood Defoe’s central thesis—God’s providential care of Crusoe: “I . . . thought these the pure productions of Providence for my support . . . ” (p. 66), Crusoe says of the grain. Perhaps other sketches by Blake of Robinson Crusoe have survived and can now be identified. Blake may have planned to contribute to one of the numerous illustrated editions of Robinson Crusoe which began to multiply from about 1791. If he expected to help Thomas Stothard with the plates for the edition published that year for The Novelist’s Magazine, he was disappointed: his name does not appear there, even though by this time Stothard and his publisher, Harrison, were constantly employing his burin. But perhaps the identification of these sketches will lead to the discovery of Blake plates in some long-forgot edition of Robinson Crusoe. At least they demonstrate Blake’s interest in the imaginative dissenter beside whom he now rests.